The Smedley spring-type dynamometer has been used successfully for many years to measure grip strength. 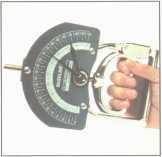 This institutional hand dynamometer is made from light-weight aluminum. The adjustable handle comfortably accomodates to any hand size. Units are calibrated to both pounds and kilograms. Case included.